This area is probably the most widely debated part of strategic planning. Having goals, objectives, and strategies are great, but knowing how they all work together (if in fact they do) and if you need them all is another story. Ignore the semantics and focus on establishing a time frame. What matters is having a combination of long-term and short-term markers to keep your organization moving in the right direction. 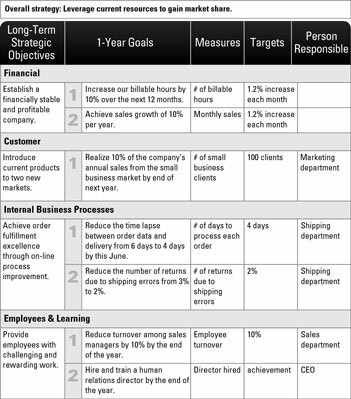 The figure illustrates how to use the four balanced scorecard perspectives as well as how strategies, goals, and objectives fit together.